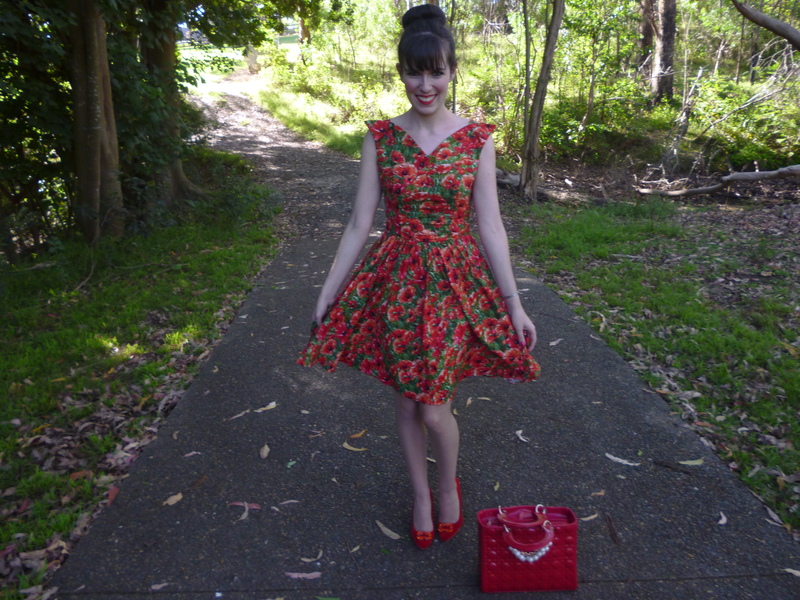 In recent times I’ve seen the ‘Wizard of Awesome Dress’ from Modcloth mentioned many times in the blog world. I know many of you are familiar with this piece. I am happy to tell you that I’m now the proud owner of the ‘Wizard of Awesome Dress.’ I’ve actually had it for a number of months now (purchased with this dress here) but I’m finally able to wear it. I have two Bernie Dexter dresses (I posted the other here) now and both have been excessively long. So, for some time, the ‘Wizard of Awesome Dress’ joined my ever growing pile of clothes requiring alterations. The good news is that it is finally hemmed and is ready to wear. How exciting! I love this dress. The pattern, colour scheme and unique neckline are adorable. 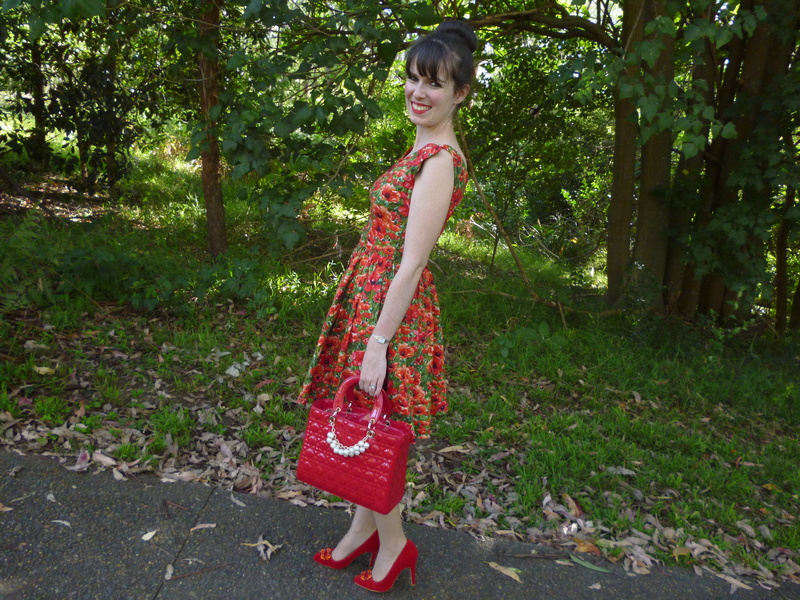 The poppy floral print is seen much less often than other florals. I decided to style it with bright red accessories to accentuate those tones in the dress. However, one of my favourite parts of this dress is the amount of styling options available. I think it would look fabulous with green accessories such as my new green coat (yes! I finally found the right one!) The floral pattern also displays a slightly orange hue so I believe this would provide a myriad of options. I look forward to trying these combinations. My one issue with this dress is the winged shoulders. I think they look amazing and beautiful. However, they will not stay in position and are continually flopping down. It’s rather annoying. It would be great if they were structured with firmer material. I’m happy with the ‘Wizard of Awesome Dress’ overall; it’s a fun and lovely vintage inspired piece. In terms of Bernie Dexter dresses, my hope is that one day I will own the ‘Amour and More Dress’ which is currently sold on Modcloth by Bernie Dexter. My OASAP bag, which I have in both red and white, is starting to become part of my signature look. I love this bag so much and it’s hard to find an outfit that doesn’t go with either the red or white version. I feel like I’m the advertisement for this bag at the moment. OASAP is currently using my images to sell the product. Check it out here. 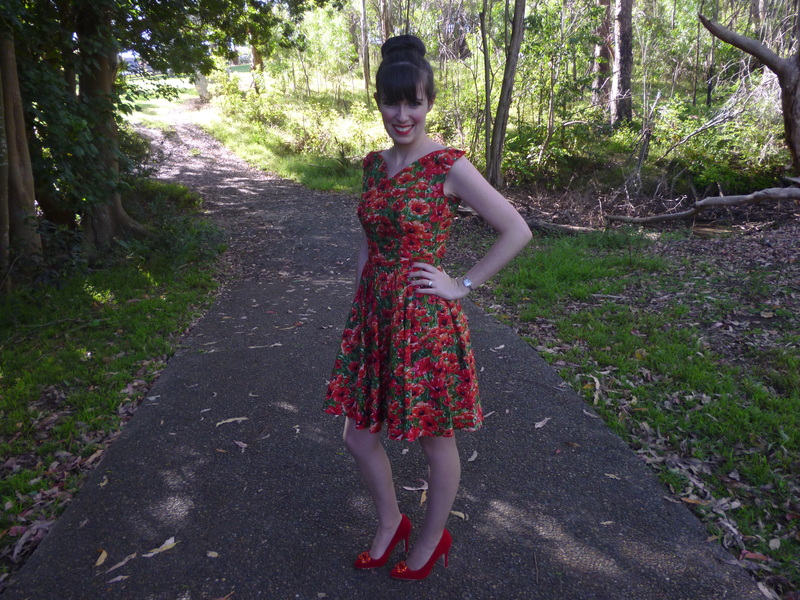 This entry was posted in Florsheim, Modcloth, Outfits, Uncategorized. Bookmark the permalink. This whole outfit is so, so pretty! You look again so beautiful in this wonderful floral dress and I like it so much that you wear this flower in your hair <3 And as usual you add a perfect bag! What exciting news, they are smart to use your images, the bag is great!! Red looks awesome on you!! Nice hair accessory!! You look so cute!! I love your hair in these pictures! love this gorgeous red dress! Love your dress. Pretty patterns. Very elegant! Beautiful lady in red! love everything about this look! I love this dress so elegant, colorfull, but delicate!!!! You look pretty, as usual, my dear friend! This dress looks like it could be right out of 'The Notebook' so flirty and gorgeous! You and your gorgeous dress collection! Awe, I wish I could raid your closet too, hehe. Oh, I love this dress, Imogen! You look so pretty in it, and your face seems to be glowing. I haven't worn a dress in so long, but this design would be so cute as a shirt too. You look simply lovely today. That dress is stunning, such a beautiful look! oh, wow! This outfit is definitely one of my favourites) You look like a beautiful flower in those shades of red and pink)! Those photographs are adorable as well! Hello dear! Honestly I don't know the wizard you are referring to, but you look fairy-tale-beautiful to me! 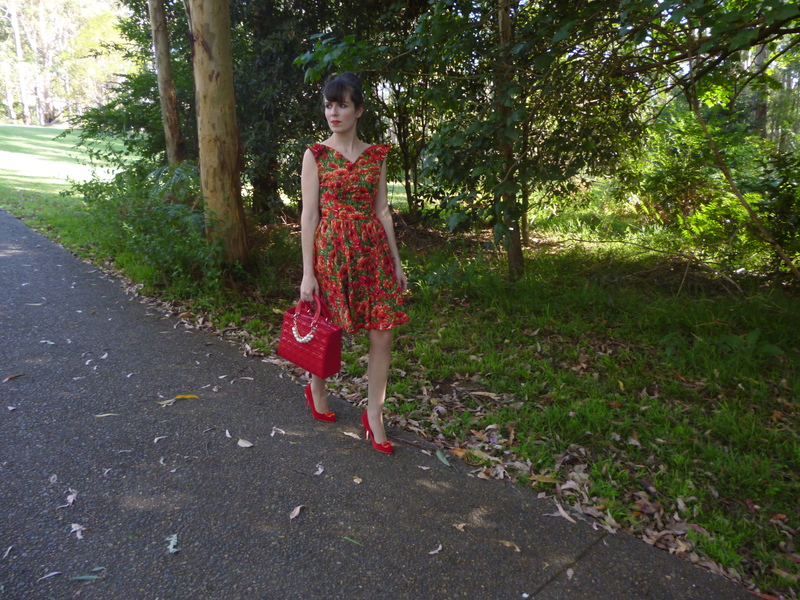 This dress is really delicious and I love poppies! I have seen your photos on Oasap, you should be really proud. Compliments. Oh the neckline is so lovely! I love how everything is so you. You stick really well to your style which I love! 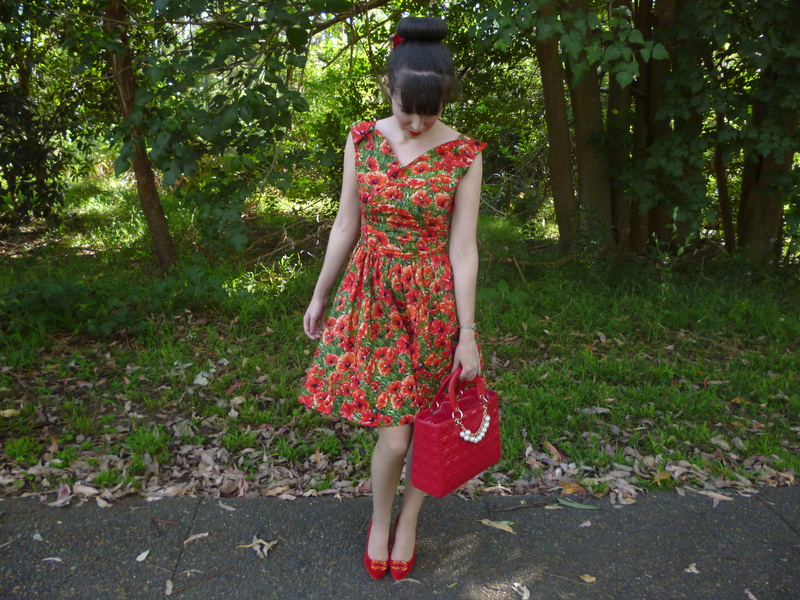 Love your girly vintage-ness! 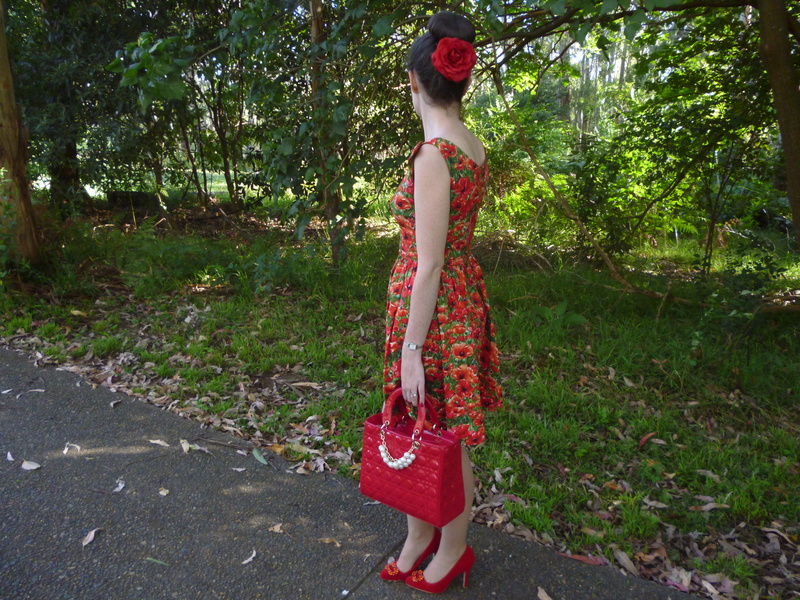 You're rocking this dress and the bag is beautiful! Thanks for linking up!! I totally see why OASAP would use this picture…the dress is beautiful and I love that you added a flower under your bun. Keep up the great work! I rally think you must been a girl who own lot of beautiful dresses! such as this one.